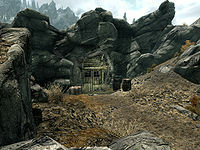 Redoran's Retreat is a small set of bandit caves to the northwest of Whiterun. It's a small cave system consisting of two rooms that appears to be an old abandoned mine as it has been dug by man. It contains two bandits and a dog. A boss-level bandit may also be present and can usually be found near the chest in the last room. It is found on the plains west of Whiterun, at the end of a path that winds around behind the rock into which the entrance is built. The effect is the entrance is concealed from the road, which leads to Hamvir's Rest from Whiterun. The entrance consists of a pair of wooden doors built into the side of a large rock, appearing like those of a typical mine. There are a number of unusable barrels and a crate on either side of the doors. There are many fungi growing in the caves as listed below. There are plenty of food barrels and sacks, as well as crates and unusable barrels found throughout the cave system. The entrance leads into a passage that descends to the west before turning north as it continues to descend. It then passes a narrow braced section entering the first cavern. It is lit by strings of lanterns overhead. There is a set of shelves on the left holding four bottles of ale and a Bandit patrolling the chamber beside a rock pillar and a dog (see bugs) wandering around the chamber. Behind the pillar to the east is a novice-locked chest containing minor loot and a small wooden table to the left with six loose septims and two iron arrows on top. To the west is a narrow passage that after a couple of turns opens into a second chamber, where another bandit is found wandering and a boss-leveled bandit is seated at the rear. There is a central rock pillar in this chamber and two bone chimes hanging from the ceiling. To the left is some wooden planking on the ground with three unowned bed rolls on top and a small wooden table holding a bottle of ale. To the right is a small unit holding a leg of goat and two cabbages. To its right again, a second unit holds a random healing, magicka, or stamina potion. At the rear of the chamber is a campfire with a cooking spit over it. A copy of the Sneak skill book 2920, Last Seed, v8 sits on a crate to the east. To the right, an unlocked boss-leveled chest is protected by a bear trap in front. The chest holds Treasure Map IV. Along the north wall are many food barrels on some more wooden planking. 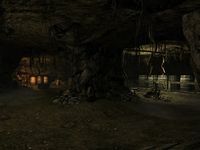 The name of cave may refer to the Great House Redoran from Morrowind. An iron ore vein is located on the rock that forms the roof of the cave entrance. The dog will not respawn after being killed. This page was last modified on 7 January 2019, at 05:01.